When it comes to human migration, nearly everything we hear nowadays in relation to the United States and Europe is related to immigration into North America and Europe. Historically, however, governments have often been as concerned with emigration as they have been with immigration. This is not surprising since government have always attempted to "monopolize the legitimate means of movement" as noted by historian John Torpey. For Torpey, author of The Invention of the Passport: Surveillance, Citizenship and the State, a preferred method of "regulating international movement" has been the passport. Wendy McElroy puts things less subtly when she describes the passport as a tool the state can use to "exert social control by refusing travel to 'enemies of the state.'" It should not be surprising, then, that the US government is now cracking down on Americans who have outstanding tax bills — by holding their passports hostage. This could affect more than 360,000 Americans. In an extremely troubling move three years ago, the Republican-controlled Congress handed the Internal Revenue Service the power to strip individuals of one of the most important and tangible rights possessed by American citizens – their passports. The Service is now starting to use this hammer. Barr rightly points out that, given we already know the IRS uses its power to target political enemies, this new power of the agency is especially troubling. He also asks how long other agencies might demand similar power from Congress, such as the power to stop a citizen's ability to "secure a driver’s license, obtain[...] a loan from a federally-insured financial institution, or clear[...] a background check prior to purchasing a firearm?" These sorts of powers have long been used by abusive and authoritarian states. But the ability to regulate movement through emigration and travel controls are especially attractive to states. The US, of course, has long been especially contemptuous of potential emigrants, as "the United States is one of only two countries (the other being Eritrea) that taxes its citizens no matter whether they reside." 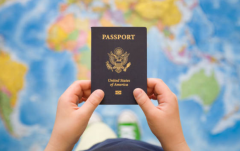 This acts as a sizable disincentive to Americans looking to move abroad. And now, if you fail to pay taxes while living outside the US, the IRS can simply revoke your passport if you return to the states. Most Western European states stopped trying to restrict emigration in the nineteenth century because of a shift from a mercantilist policy of hoarding population to laissez-faire capitalism allowing workers greater freedom of movement to sell their labor, and the related ascendancy of a right to exit in liberal political philosophy. Fitzgerald's work specifically focuses on pre-1970s Mexico as a case study in emigration control. Mexican nationalists had long yearned to prevent emigration by a variety of means, fearing both domestic labor shortages and "national humiliation" caused by large outflows of emigrants. In 1904, for example, "Mexican federal and state authorities ordered municipal governments to stop issuing travel documents used by U.S.-bound workers." Similar measures were used over the years, but Mexico's liberal constitution, and the realities of a decentralized political system, made it difficult to control emigrants. Mexico was hardly alone in its nationalism-inspired opposition to emigration, especially during the late nineteenth century and early twentieth century. In Europe, efforts to refuse emigration outright, and in general, were usually rejected, but efforts were made to prosecute those who facilitated emigration. In the late nineteenth century, for example, these so-called "emigration agents," who usually were in the business of helping people re-locate to the United States, sometimes faced criminal prosecution. According to Tara Zahra in The Great Departure: Mass Migration from Eastern Europe and the Making of the Free World, "In 1914, over three thousand agents faced criminal charges in the Austrian half of the monarchy... They were clearly orchestrated as a warning to would-be emigrants about the hazards of leaving home." Often the agents were accused of human trafficking or of swindling their customers. It is likely that these accusations were true some of the time, but the the motivation behind efforts to discredit these travel agents appears to have been more nationalism than consumer protection. The English Passenger Vessel Act of 1803, initially intended to monitor shipping firms, were gradually expanded to regulate emigration agents, labor brokers, and rooming houses, in order to protect migrants from unscrupulous brokers. Laws passed in France in 1854 and Belgium in 1876 required emigration agents to obtain licenses. The Swiss government was the first to ban advertising for emigration completely. Closer to home, Bohemian authorities banned emigration agencies in the 1850s. Other laws regulating emigration followed in Japan (1896), Germany (1897), Italy (1901), and Hungary (1903). The Hungarian law was the most restrictive to date, and it became a model for legislation across East Central Europe after World War I. In the Hungarian legislation in question, "Hungarian men were not legally permitted to emigrate after their seventeenth birthday without written permissions from the Defense and Interior Ministries." The stated purpose of many of these laws was the "protection" of citizens who exposed themselves to potential danger and impoverishment by emigrating. Anticipating the American policy of revoking passports of alleged tax delinquents, German states required that emigrants "settle all debts and taxes" before being allowed to leave. In some cases, as in Russia, an "emigrant" passport was available only after paying a stiff "fee" and the document was a one-way ticket out of the country. Return was forbidden, and ensured an emigrant was cut off from family ties. It also meant the emigrant risked statelessness if unable to enter the destination country. The Russian distaste for emigration, of course, brings to mind the years of the Iron Curtain when emigration controls were used across Eastern Europe. Indeed, when modern people think of recent emigration-control efforts, they tend to think of the Berlin Wall and the communist world in general. But these controls weren't limited to communist countries. The Nationalist Chinese regime in Taiwan was known to use emigration controls up until the 1980s. Often, these laws were selectively enforced. Emigrants with property were often stripped of their property or simply barred from emigrating. Less desire potential emigrants were allowed, or even encouraged to leave. In multi-national Austria-Hungary, for example, local officials often encouraged minority ethnic groups to leave, in order to solidify the majority of the locally dominant ethnic group. The was sometimes then accompanied by efforts by ethnic nationalists to prevent emigration by members of the locally-dominant ethnic group. Then as now, migration policy, whether involving immigrants or emigrants, was employed with the hop of manipulating demographics. passports were not mandatory [in the United States] except for a period during the American Civil War (1861–1865) and during World War I (1914–1918). The latter can be seen as the beginning of the current American passport. On December 15, 1915, President Woodrow Wilson issued Executive Order No. 2285, "[r]equiring American citizens traveling abroad to procure passports" and advising the "Secretary of State, in co-operation with the Secretary of the Treasury, will make arrangements for the inspection of passports of all persons, American or foreign, leaving this country." Passport law varied between permissive and restrictive until World War II, after which passport mandates became nearly universal. As is so often the case, the state uses war and foreign policy interests as excuses to crack down on domestic freedoms. Nor did taxation of non-citizens exist until the twentieth century with the advent of the income tax. There had been efforts to tax all emigrating American citizens indefinitely before this. But it was only after the passage of the sixteenth amendment, and the Supreme Court's ruling in Cook v Tait, that taxation of American emigrants became well-established in American law. During the Cold War, politicians were often keen on comparing the United States to the Soviet Union and pointing out how many freedoms Americans enjoyed compared to the Soviet. Free emigration was one of the freedoms. In the United States of 2018, though, you're only free to leave if the IRS says so — and as long as you keep paying taxes to the US government indefinitely, no matter where you are. Many of the anti-emigration laws of nineteenth-century Europe looks positively enlightened in comparison.